Over the last decade in my physical and energetic therapy practice, I’ve detected and identified past traumatic life experiences stored in the body driving pain, injuries, disease and addiction in individuals and whole families. We all know that childhood trauma shapes our character. You may be interested to know that past adversity also sets your body on a destructive course with an endgame – cancer, heart disease, chronic pain, skeletal fractures, addiction, obesity, diabetes and suicide. I’m referring to the landmark Adverse Childhood Experiences study in the mid-1990s, led by Dr. Vincent Felitti, then Chief of Preventative Medicine for Kaiser Permanente, and the Center for Disease Control (CDC), which determined childhood trauma as a high risk factor for some of the most life-threatening diseases in America. Our bodies arm us with a protective autopilot system a.k.a. fight-flight-freeze that if not reset after exposure to trauma can harm us. Though this study was performed in the 1990s, physicians and the healthcare professionals are beginning to see that we are in the midst of a silent national epidemic—driven by childhood trauma. Adverse Childhood Experiences are defined as neglect, physical or verbal abuse, sexual abuse, domestic violence, absence of a parent through divorce or early death, a parent with a substance abuse problem or mental illness, or a family member who has been incarcerated. The ACEs study examined more than 17,000 patients to determine a body score. The participants filled out a questionnaire that probed their past. People with an ACEs score of four or more were at a higher risk factor for the leading causes of death in America as well as early mortality compared to the average national lifespan. Essentially their lives ended 10 years earlier sometimes more. But let’s not get to that in our bodies or our families. Let’s find out your body score – take the ACEs questionnaire. We can reset your body’s path to health and move through the past pain. You have the power to prevent these diseases from invading your body and your family. The latest news on our nation in pain reports Americans, make up 5% of the population but we consume 80% of its opioid supply. Read article: Why are Americans in so much pain? We are so conditioned to take a pill to suppress our pain. Let me tell you right now there is another way. The results are not covering up the pain but instead eradicating the pain. For those of you who don’t know, Centripetal Force, is the force to bring the body off course back into balance and on a path of health. My investigations of the body at Centripetal Force Studio turned out to be in line with the ACEs study. 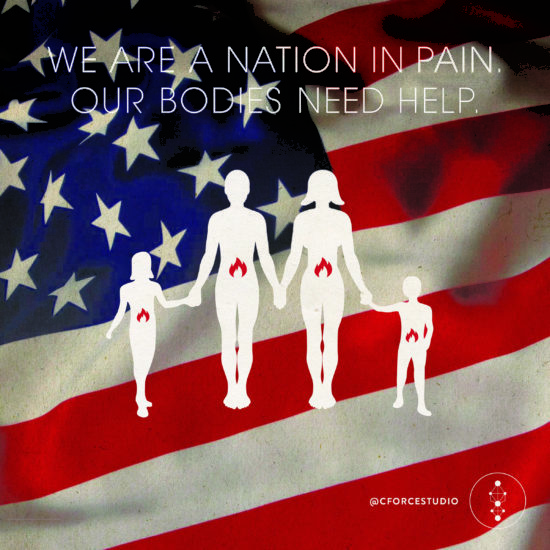 We are a nation in pain – our bodies are in a constant tailspin of fight-flight-freeze and in need of a serious reset to rest and repair. The recent studies of the ACEs by renowned pediatrician, Dr. Nadine Burke Harris, have linked asthma, eczema, ADD and ADHD as early signs in children suffering from the ACEs. Dr. Harris, founder of the Center for Youth Wellness, has just been appointed to California’s first Surgeon General. I see this as a step in the right direction. In November 2018, the Journal for American Medical Association JAMA Pediatrics published the latest wide ranging ACEs study across 23 states with more 214, 157 participants. The study found 3 out 5 adults scored at least one ACE and one quarter of Americans have three or more. This study underscores the root of our public health problem – childhood adversity. It’s time to excavate our traumatic experiences and blow open the doors of our childhood homes to eradicate puzzling pain and disease. I’ve come to realize that we must begin with ourselves to heal our bodies, our families and more widely our nation in pain. I feel obligated to point out here childhood trauma can be passed on from generation to generation. So, if you have a blind spot or can’t remember the trauma from your past, review your family history. You will begin to see the roots of the transmitted pain and disease in your body. Often as children, we dissociate from the trauma. Bury it. Shut the door. Forget it, in order to survive, but your body remembers. Come into the studio and let’s reverse the destructive path of the ACEs in your body. Make appointment with Gina Calderone, Physical and Energy Therapist, and Denise Carson, Body Journalist. Or contact us and let’s set up a face-to-face via Skype or FaceTime, which ever is easiest for you.